The Pipe Prop has become the go-to pipe support tool for commercial roofs, winning over industry professionals everywhere. What is it about the Pipe Prop that makes it so effective? Pipe Prop is made of a tough, durable ASA plastic that’s made to withstand the most severe weather conditions. With installations more than 10 years old, Pipe Prop has exhibited zero loss of structural integrity or capability. We’re so sure of our product that we guarantee the Pipe Prop will not buckle, shatter, or otherwise deteriorate, even in heavy rain, wind, sunlight, and hail. According to The Plastics Web®, ASA, formally known as Acrylonitrile Styrene Acrylate, has “great toughness and rigidity, good chemical resistance and thermal stability, outstanding resistance to weather, aging, and yellowing, and high gloss.” Not only is ASA flame retardant, but it is also weather resistant, heat resistant and UV ray resistant, making it one of the top choices in plastics. Model APS-1 accommodates up to 1½-inch pipe. 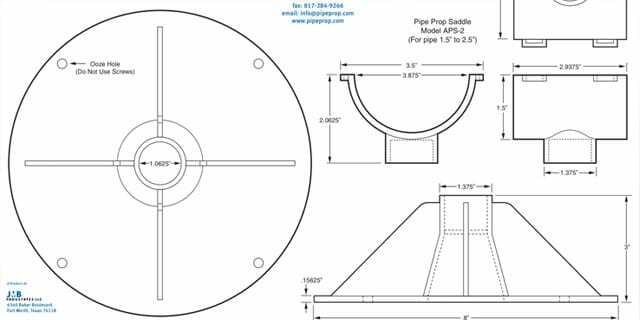 Model APS-2 accommodates from 1½-inch to 2½-inch pipe. At a 3½-inch height, Pipe Prop withstands loads ranging from 2,130 pounds at 140°F to 3,935 pounds at 140°F. The Pipe Prop is extremely light, weighing in at only 0.5 lbs. per unit, making it easy for professionals to carry onto roofs, into attics, and up ladders.